Synthesis gives away 100% of profits to these causes, bringing real change with your premium dollars. Habitat for Humanity brings people together to build homes, communities and hope. Habitat for Humanity builds simple houses with no-profit mortgages which are affordable to families with low incomes. Partner families invest hundreds of hours of their own labor into the building of their home and the homes of their neighbors, and connect with their community as they work side by side with volunteers. Habitat for Humanity of Metro Denver was the first affiliate in Colorado founded in 1979. Today 27 affiliates are building safe, decent, affordable homes in 42 Colorado communities for hardworking, low income families. Hunger can be found everywhere – often where you least expect it. The homeless population represents only about 10% of the food bank’s recipients. The rest? Everyday people like low-wage workers, children, seniors on fixed incomes and individuals with health issues. Food Bank of the Rockies is working to feed them all. Many kids from low-income families have been failing because they’re stuck in under-performing public schools or schools where they don’t feel safe or that lack the structure to fit their needs; and yet, there are thousands of open desks at excellent private schools. The problem is low-income families can’t afford to send their kids to these schools. ACE Scholarships is changing that. Kids from low-income families are given financial assistance and access to schools that are a better fit for them. It is proven that as things like safety, support and academic rigor improve, so does success. In fact, 90% of ACE Scholars graduate high school each year. And last year 73% went on to college while only 54% of low-income students across the US directly enrolled in college. A clean environment is the right of every human and Synthesis seeks to help make sure this right is realized and enjoyed by everyone. Conservation Colorado represents the next chapter in protecting Colorado’s environment. It is on the front lines protecting Colorado’s air, land, water, and ultimately… people. 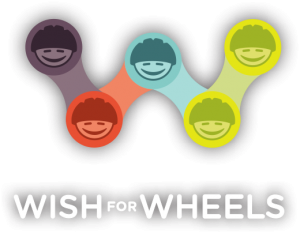 Wish for Wheels is a nonprofit organization that gives brand new bicycles and helmets to kids in low income communities. Founded on the belief that bikes bring health and happiness into these kids’ lives, they partner with organizations and individuals to help build bikes and deliver them to the community. Extravagant giving was intentionally written into our Articles of Incorporation and by-laws. Synthesis has even gone one step further and incorporated as a Public Benefits Corporation, thereby loudly proclaiming the essential nature of our business: people over profits. By law we have chosen to embrace a mandate that insists we give a minimum of 25% of gross revenue to charity, which is at least 100% of profit. Since 2014 we have managed to give more than 50% of gross revenue to charity. Learn what this means. B Corps are a new type of company that use the power of business to solve social and environmental problems. The vision is simple yet ambitions: using business as a force for good. The B Corp certification is granted after a rigorous vetting process, and is the business equivalent of the food industry’s prestigious “Certified Organic” label. Life Insurance can be confusing. Request a consultation from one of our friendly experts with no pressure and no obligation. Call, email or fill out the form below and we’ll get back to you within one business day. We promise not to hassle you or sell your email. Confident you already know what you need? INSTANT QUOTES AVAILABLE HERE.